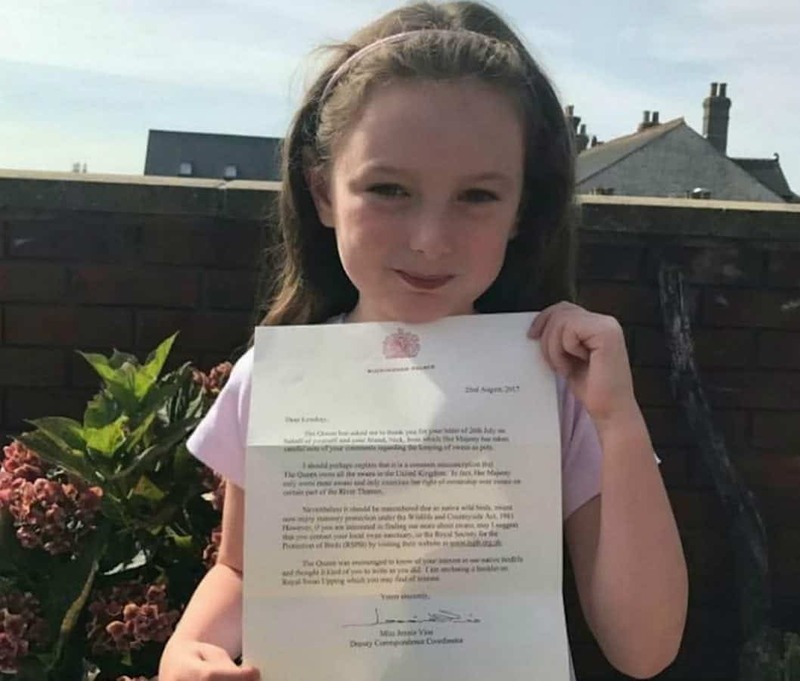 A five-year-old wrote to the Queen asking if she could borrow a SWAN for the weekend – and was thrilled to get a response from the Palace. Lyndsay Simpson sent a note to Her Majesty – saying she could look after the bird in her BATH. She loves feeding the ducks and swans and wanted to spend some time with one at home. Her mum Jennifer, from Petersfield, Hants, told her daughter the Queen owns all the swans in Britain. Lyndsay was delighted with the response which she received on 23 August and her next goal is to meet Her Majesty in person. The friendly letter back from Jennie Vine, deputy correspondence co-ordinator at the Palace, said the Queen had taken “careful note” of her comments. It explained that it was a common misconception that Her Majesty owns all the swans in the country but praised the little girl for her interest in the majestic birds. “Her Majesty only owns mute swans and only exercises her right of ownership over swans on certain parts of the River Thames,” the letter read. “It should be remembered that as native wild birds, swans now enjoy statutory protection under the Wildlife and Countryside Act, 1981. The Palace even sent her a booklet about Royal Swan Upping – an annual ceremony held in Berkshire where the birds are caught, tagged and released. “She was absolutely over the moon and was jumping up and down – she was ecstatic,” said mum Jennifer. “My daughter has always loved swans, and she has always asked me if we could have one. “I told her the Queen owns them, and she suggested that if she wrote her a letter she might let her have one for the weekend. “I asked her where we would keep it and she said ‘in the bath”. Lyndsay, who regularly feeds the birds in her local pond, posted the letter with a first-class stamp addressed to ‘The Queen, Buckingham Palace, London’. Jennifer added: “The next thing Lyndsay wants to do is meet the Queen and write a thank you letter back. “It’s absolutely amazing that they took the time and trouble to write to a little girl of five,” said Lyndsay’s grandmother Carol Bax, 60. Previous PostToddler lived through a life-threatening transplant, brother may face the same ordeal.